People are obsessed with quinoa, the “pseudograin” related to beets, spinach and chard. Why? 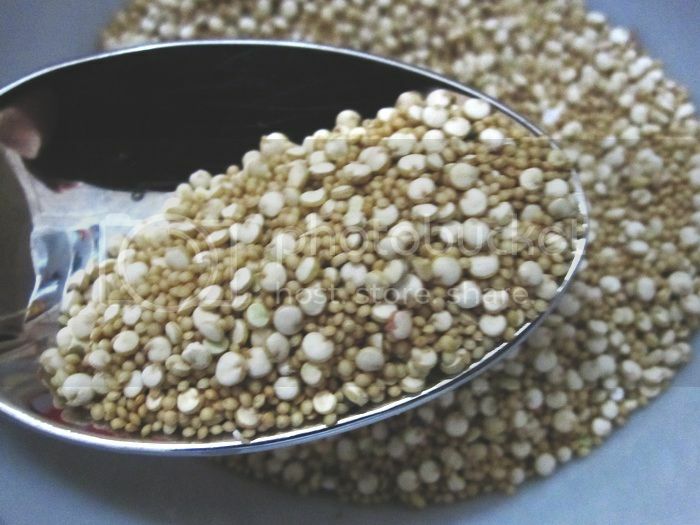 It’s not only the best substitute for grains; it’s also a superfood – rich in protein, calcium, iron, fiber, potassium, B vitamins and Vitamin E.
I use quinoa, but never really found a creative way to make something new. I have started to make choices to have my meals a little more healthier and better for the whole family. Quinoa Cuisine is packed with 150 creative, mouthwatering recipes for breakfast to dessert and all the potlucks and picnics in-between. The book is easy to navigate and organized by seasonal foods. Quinoa Cuisine includes helpful icons identifying vegetarian, 30-minute or Less, gluten-free, kid-friendly options and more. It also gives easy ways to incorporate fresh seasonal ingredients into the dishes. I was hoping to see some photos with the recipes so there is a visual view of what the dishes look like. Quinoa and Amaranth that I usually mix together in my recipes. Quinoa is easy to make and good for you. Now with this book, you will discover how to make palate-pleasing quinoa creations. From imaginative salads and tasty soups to flavorful entrées and decadent desserts, Quinoa Cuisine guides you step-by-step to make many recipes. Treat yourself and your gluten-free friends to Grilled Pizza, Biscuits and Gravy, Fried Green Tomato Salad, or Crab Cakes. It’s healthy eating without sacrificing a bit of taste. Thanks to the wonderful authors for these yummy recipes. Rich, buttery salmon is the perfect foil for the bright flavors of lemon and dill. This delicious weeknight dinner can be made in less than 30 minutes, but it’s also a nice option to serve to company. STEP 1: Heat the olive oil in a medium saucepan over medium-high heat. Sauté the onion until translucent, about 5 minutes. Add the quinoa and cook, stirring occasionally, until lightly toasted, 3 to 5 minutes. Pour in the water and bring to a boil, then reduce the heat to low, cover, and cook until the water has been absorbed and the quinoa is tender, 10 to 12 minutes. Turn off the heat and let the quinoa sit for 5 minutes. Fluff with a fork and stir in the lemon zest and juice and the dill. Season to taste with salt and pepper. STEP 2: Preheat the oven’s broiler and line a rimmed baking sheet with aluminum foil. Season the salmon on both sides with salt and pepper. Place on the prepared baking sheet and broil until cooked through, about 10 minutes. The salmon is done when it is no longer translucent in the middle. STEP 3: To serve, divide the quinoa mixture among four plates. Top each with a salmon fillet. Jessica Harlan has written about food and cooking for nearly twenty years for publications such as About.com, Clean Eating, Town & Country, Mobil Travel, Gaiam.com and Arthritis Today. 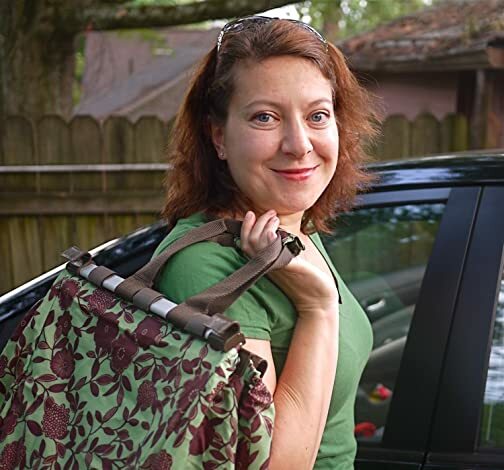 She is the author of the book, Ramen to the Rescue and lives in Atlanta, Georgia. Currently, Jessica is the Cooking Equipment Guide for About.com and writes a regular kitchen tools column and recipe for Clean Eating magazine. She has written about food, cooking and kitchen products for Town & Country, Pilates Style, Arthritis Today, Consumers Digest, Time Out New York and Mobil Travel Guide, among others. Kelley Sparwasser began a career devoted to food and wine in Portland, Oregon, where she completed cooking schools and worked in area kitchens. Since then she has been on the editorial staffs of McCall's and Food Arts. She opened a restaurant consultancy before returning to Oregon to pursue her passion for pinot noir as Direct Sales Manager at Penner-Ash Wine Cellars. 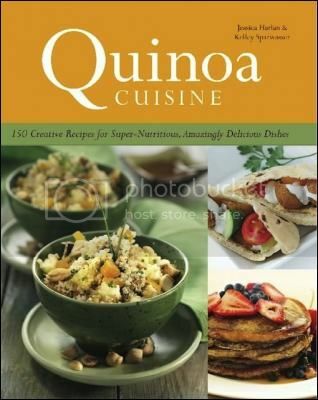 One (1) lucky reader will have a chance to win their own copy of "Quinoa Cuisine" to make healthy recipes. Chosen winner will be selected via Random.org through Rafflecopter and is open to US & Canadian residents (ends May 7, 2012 at 11:59pm EST). Winner will have 48 hours to respond to claim their prize. Disclosure: I received a complimentary copy of the mentioned book from the company/PR Company in exchange for my review. The opinions expressed in my review are my own personal and honest thoughts. No other compensation was given. I have no idea what I would make with quinoa my daughter was just recently diagnosed with Celiac Disease. I would think I could make cookies with it... that is why I need the recipe book. I recently made a chickpea, quinoa stew that was amazing. Besides that we usually have it as a side dish. This would be a great resource to have for quinoa recipes! I am unsure what I would start with but I am a cookbook freak and I have gone through every recipe in some book. I will cook everything that my kids will eat! I'd like to try making the Crab Cakes that you mentioned in your post. I follow you on GFC and Google+ as Lisa K Hansen. I'd add it to steel cut oats to incease the protein content and get a better start to the day. All I can say is Broiled Salmon (as you stated) because I'm not too familiar with it although I know that it is healthy and would like to use it more (at all) in my cooking. Thanks for the chance. I have a box sitting in my cupboard waiting for me to search out a recipe to use it in! I love tabbouleh and that's what I usually go for but I would love to try some other recipes! I'd make breakfast items like muffins and oatmeal with quinoa mixed in.